To start off the Worlds group stages, Counter Logic Gaming take down G2 Esports. Much like MSI, Counter Logic Gaming looked really good in match 1, and G2 didn't. CLG take down G2 in the first match of the 2016 World Championship group stages, and they did it with a storm. After a first blood from G2 onto Expect in the top lane, CLG fired back, and specifically from Xmithie. Xmithie on Olaf was all over the map, finishing with a score of 6/0/5. The pre-draft ideas from both teams were relatively straight-forward. G2 came into the match with the mindset of "Let's poke a bit, and be ready to pick players." For CLG it was a "Let's get Stixxay going on Caitlyn, and we have countless of ways of disengage and engage." CLG had massive amounts of abilities to use to whether it be with Darshan's teleport flanks with Poppy, or Xmithie getting in with Olaf. Since it is the beginning of Worlds, this match only tells us so much. Is CLG this good? Or is G2 just not as good as we thought they'd be be? From this writer's perspective, it seemed like a mixture of both. CLG seems to always have a good grasp on the meta, and they may have caught some slight luck from getting to play G2 in the very beginning. This is crunchtime now for G2. G2 in the first place couldn't afford to lose games to CLG, so this is a really big deal from EU's champion. Other than G2 Expect, nothing was going right for G2 in this game. 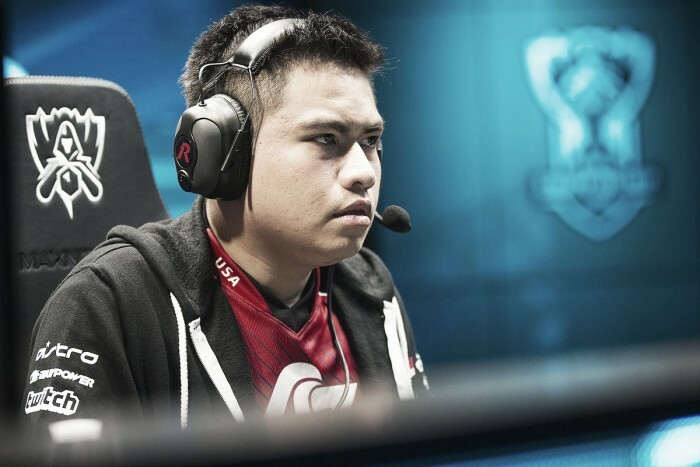 CLG Xmithie was everywhere, causing havoc with Olaf. Notable statistics from CLG include Darshan finishing with a 2/2/7 score on Poppy, Huhi with a 2/0/7 on Vlad, Stixxay with a 4/1/8 score on Caitlyn, and Aphromoo with a 0/1/13 score on Nami. We have yet to see too much from the field as the "meta" right now, but you can expect one thing: excitement. This first game was exciting, gripping, and is foreshadowing how this tournament will go.